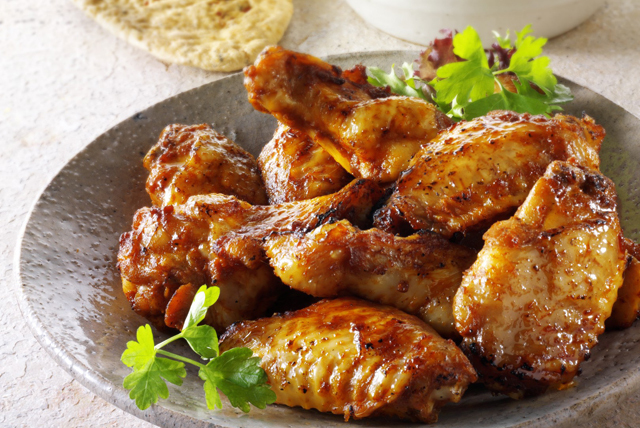 Try our spicy grilled chicken wing recipe. Start off with a rub made with cayenne pepper, ground cumin and smoked paprika on the chicken wings. Finish off the wings on the barbecue, and brush with ranch dressing for moist and tasty chicken wings. Place wings in large bowl. Combine dry seasonings; rub evenly onto wings. Heat greased barbecue to medium heat. Grill wings 15 min., turning occasionally. Brush lightly with dressing. Grill 5 min. or until wings are done, turning and brushing frequently with remaining dressing. These spicy wings are great served with carrot and celery sticks, and a blue cheese dip. Heat oven to 425ºF. Place wire rack on foil-covered rimmed baking sheet; arrange wings in single layer on rack. Bake 35 to 40 min. or until done, brushing occasionally with dressing.